I was looking out over our garden the other day, observing the neat rows and the wire fence surrounding it. This made me think of the Qabalist idea that the evolution of humans is about us learning how to harness the laws of nature for our own advancement. I'm not sold on the idea, but it led to other thoughts, mainly bringing to mind The Chariot and Strength cards. Both are cards of power and control, but in very different ways. 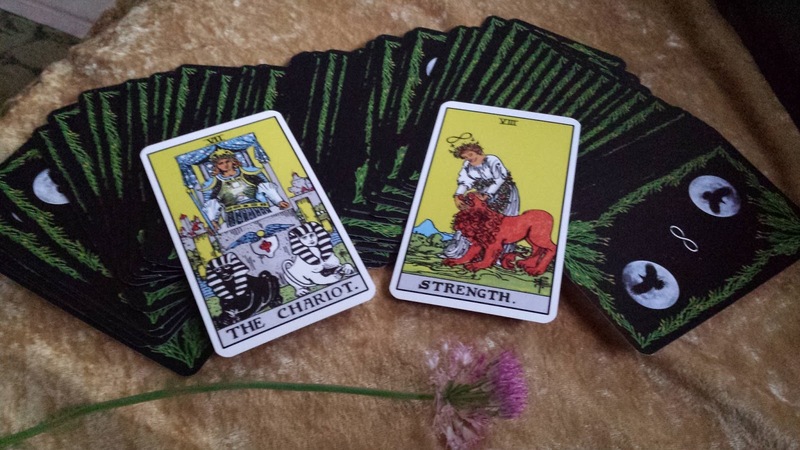 The Chariot is about willpower, and self-assertion, and a forceful control of the situation. It is necessary at times, but can also have some negative side effects. My encounter with a carpenter bee that had burrowed into our steps illustrated this to me. I needed to take action or our wooden steps would eventually be weakened and unsafe and need to be replaced. To "defend" our home I exerted my will in a forceful way that ended the life of the carpenter bee. I made a decision I felt was necessary, but I didn't walk away from it feeling like a victor. Another creature's will and life were compromised so that I could take control of the situation. Strength is also a card of taking control, but in a much more compassionate, mutually beneficial way. As my wife and I were planning our honeymoon / one year anniversary trip, we came across a guy who leads foraging expeditions where you go out into the woods and gather mushrooms, nuts, seeds, flowers and other edible plants and then take them to a local restaurant and have them cooked. Apart from sounding very exciting to both of us, I also got a picture of the mode of control of Strength - almost a symbiotic relationship between nature and man, where we would be exercising our will and seeking our good but almost in a cooperative way with the world around us. These two simple illustrations from nature gave me a much deeper insight into the modes of control represented by The Chariot and Strength cards. And while the examples were from nature, the same idea applies across all of our interactions in life. Would you like to share any examples of where you see contrasts between the forceful control of The Chariot and the strong but compassionate control of Strength? Feel free to comment here or on any of the social media sources where you linked to this article.